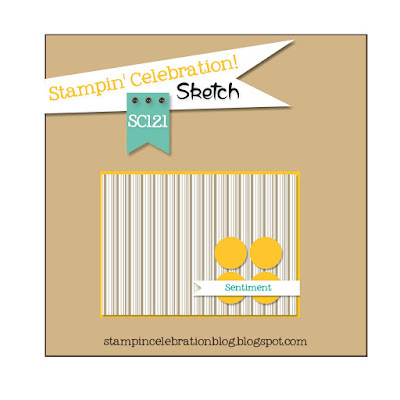 Welcome to the Stampin' Celebration January Sketch Challenge (SC121). A fun sketch with so many options! I did consider getting a head start on Valentine's day and use hearts for the four circles. And then I saw the new Botanical Blooms bundle from the Stampin' Up! 2016 Occasions catalog and new I wanted to try this set out! I love these new framelits! The flowers that have the 3-dimensional effect are just beautiful and add some great dimension to any project! Look how fun these flowers as they overlap the sentiment banner. So cool!! For this project I used Watermelon Wonder for the flowers and Mint Macaron for the leaves. Early Espresso helps add some depth. And enamel dots in Mint Macaron help pull the colors together! The greeting is from the Stampin' Up! 2015-16 Annual Catalog, Remembering Your Birthday. I used some scotch tape to cover the part part of the stamp I did not want to include in the greeting and then removed the tape after inking the stamp. Worked perfectly! I hope this sketch inspires you and I can't wait to see what you create!